From the start of the winter timetable, 13th December 2010, Chiltern Railways commenced a few services operated by Loco Hauled Coaching Stock (LHCS), though prior to this were several trains that stood in for unavailable 168 units or ran for timing trials, also test trains for clearances etc. Initially, one train was provided by Wrexham & Shropshire as part of its normal diagram, and the other train was operated by Chiltern with a rather scratch set of stock. 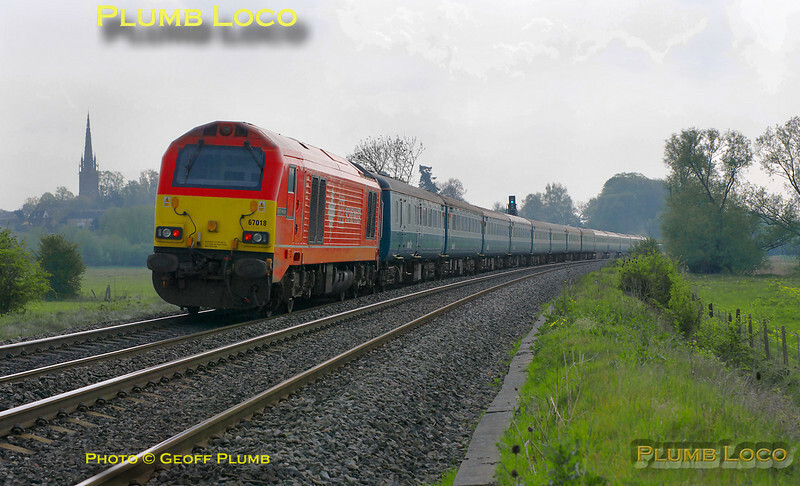 Since the demise of WSMR, more stock and locos have become available and the set from Birmingham strengthened to five coaches. It seems more LHCS services will be introduced from the new timetable starting in May 2011, and associated training runs have been taking place between Bicester, Banbury, Birmingham Moor Street and Stourbridge. 1Z33 was the 09:15 train from Bolton to Wembley Stadium for the FA Cup Semi-Final match with Stoke on Sunday 17th April 2011. 67027 is leading the train and carrying the "Bolton Wanderers Supporters Train" headboard as it approaches King's Sutton at 12:25. The train consisted of 12 Mk.3 and Mk.2 coaches, all in blue/grey livery with 67018 "Keith Heller" on the rear. This train was also routed via Oxford and the GWML to reach Wembley via Acton Wells and Neasden Junctions. Digital Image No. GMPI8741.